The OMC stern drive was produced by the Outboard Marine Corporation from 1962 until the end of 1992. Because the 1962 and 1963 models used only an 80 horsepower V4 outboard powerhead, for all practical purposes it could be said that the first modern OMC sterndrive was not made until 1964 when it became available with the 110 horsepower 153 cubic inch inline 4 cylinder Chevy II automotive engine. While OMC’s sterndrive competitors Mercruiser and Volvo mounted the rear of the engine to the inside of the transom and mounted the front of the drive to the outside of the transom, OMC took a completely different approach. They mounted the engine and sterndrive on the stringers of the boat; the drive was sealed to the transom with a large rubber diaphragm. The OMC stern drive was then referred to as the stringer mount drive or “stringer”. Although the ball gears and the stringer mounting system was a radical departure from the Mercruiser and Volvo, perhaps the most unusual difference between the early sterndrives was the method of shifting the drive from forward to neutral to reverse. While Mercruiser and Volvo used a very traditional, mechanical form of shifting actuated by a shift cable, the early OMC “stringers” used electric magnets to engage the forward and reverse gears. Because the newer model “stringers” utilized the traditional mechanical shifting (similar to the Mercruisers and Volvos) the OMC stringer sterndrives can be divided into two distinct groups; the 1977 and earlier models are called the electric shift OMC stringers and the 1978 to 1985 models are called the mechanical shift OMC stringers. Another unusual aspect of the OMC stringer is the method used to trim the drive while operating the boat. 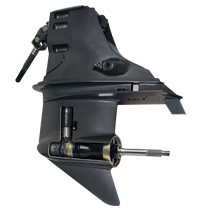 Utilizing U-joints, the Mercruiser and Volvo drives can be tilted/trimmed separately from the engine. This tilt/trim adjustment is made with hydraulic trim rams. The OMC ball gear system doesn’t allow the drive to be tilted/trimmed separately from the engine. The complete engine and drive assembly must be rocked back and forth within the boat to trim the drive and propeller. The front of the engine is lifted or lowered to change the propellers angle of attack. Introduced for the 1986 model year was the Cobra. OMC built an all-new, modern sterndrive factory in Lexington, Tennessee and started producing a traditional style sterndrive. Drawing heavily on the Mercruiser and Volvo sterndrive designs, the new Cobra had a transom mounted drive utilizing U-joints and trim rams. The engine was mounted solidly to the stringers in front and to a transom mounted plate in the rear. To entice the boat manufacturers who had installed only Mercruiser drives in the past, the OMC Cobra was designed to fit in the same size cut-out hole (in the transom) as the Mercruiser. This way a boat could be manufactured, the transom hole cut, and either the Mercruiser or the Cobra sterndrive package could be installed per market demand. Rigging the boat with a Cobra sterndrive was as easy as rigging with a Mercruiser sterndrive. Even the steering cables could be interchanged! All 1978 – 1985 stringers and 1986- 1992 Cobra drives can be divided up into two categories. During the early production of the OMC stringers the 4-cylinder drives were known as the 400 series and the V6/V8 drives were known as the 800 series. The differences between the 400 and 800 drives are in the lower gearcase. The 4-cylinder gearcase and gears are smaller in diameter than the V6/V8 gearcase and gears. The only pieces to survive the OMC redesign from the stringer to the Cobra were the 400 and 800 lower gearcases. Other than minor differences in the shift mechanism, the stringer lower gearcases and the Cobra lower gearcases are virtually identical with many interchangeable parts, including the housing itself! Both the 400 and 800 series gearcases evolved from the Johnson/Evinrude outboard line (a division of OMC). The 4-cylinder/400 gearcase is similar to the V4 outboard gearcase and the V6/V8/800 series gearcase is similar to the V6 outboard gearcase. Other than the addition of a water pump, different drive shaft and shift mechanisms the stringer and Cobra gearcases will interchange with some of the outboard gearcases! Although later models discontinued the use of the phrase 400 or 800 series, the terminology is still used by some OMC mechanics to identify a small gearcase from a large gearcase on both the stringer and Cobra sterndrives. While most people will admit that the OMC stringers were poorly engineered, the OMC Cobra had some pretty innovative features. The new modern factory and the Cobra engineering attracted the attention of Volvo and in 1993 OMC and Volvo entered into a joint venture and began producing a hybrid sterndrive with the OMC Cobra transom plate assembly and the excellent Volvo cone clutch outdrive. Sold as the Cobra by OMC and the SX Drive by Volvo, this drive had the best of both manufacturers. Because the new hybrid sterndrive used the same transom plate as the Cobra, Volvo now had a drive that would bolt into the same size transom cutout hole as the Mercruiser. The new Cobra/Volvo hybrid sterndrive shared only the transom assembly with the 1986-1992 OMC Cobra. Everything behind the transom plate bell housing was Volvo engineering. Realistically, with the introduction of this sterndrive in 1993, we can say that the OMC sterndrive engineers were put out of business when the last of the OMC designed sterndrives finished production in 1992. On December 23rd 1998, Volvo purchased the Lexington, Tennessee factory and all of the production rights to the OMC sterndrives, thus officially ending the OMC sterndrive business.